The Erie Canal is a canal in New York, United States that is part of the east–west, cross-state route of the New York State Canal System (formerly known as the New York State Barge Canal). Originally, it ran 363 miles (584 km) from where Albany meets the Hudson River to where Buffalo meets Lake Erie. It was built to create a navigable water route from New York City and the Atlantic Ocean to the Great Lakes. 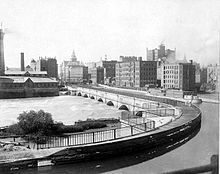 When completed in 1825, it was the second longest canal in the world (after the Grand Canal in China) and greatly affected the development and economy of New York, New York City, and the United States. The canal was first proposed in the 1780s, then re-proposed in 1807. A survey was authorized, funded, and executed in 1808. Proponents of the project gradually wore down opponents; its construction began in 1817. The canal has 34 numbered locks starting with Black Rock Lock and ending downstream with the Troy Federal Lock. Both are owned by the federal government. It has an elevation difference of about 565 feet (172 m). It opened on October 26, 1825. In a time when bulk goods were limited to pack animals (a 250-pound (113 kg) maximum), and there were no railways, water was the most cost-effective way to ship bulk goods. The canal was denigrated by its political opponents as "Clinton's Folly" or "Clinton's Big Ditch". It was the first transportation system between the Eastern Seaboard and the western interior of the United States that did not require portage. It was faster than carts pulled by draft animals and cut transport costs by about 95%. The canal gave New York City's port an incomparable advantage over all other U.S. port cities and ushered in the state's 19th century political and cultural ascendancy. The canal fostered a population surge in western New York and opened regions farther west to settlement. It was enlarged between 1834 and 1862. The canal's peak year was 1855, when 33,000 commercial shipments took place. In 1918, the western part of the canal was enlarged to become part of the New York State Barge Canal, which also extended to the Hudson River running parallel to the eastern half of the Erie Canal. In 2000, the United States Congress designated the Erie Canalway National Heritage Corridor to recognize the national significance of the canal system as the most successful and influential human-built waterway and one of the most important works of civil engineering and construction in North America. The canal has been mainly used by recreational watercraft since the retirement of the last large commercial ship, Day Peckinpaugh, in 1994. The canal saw a recovery in commercial traffic in 2008. From the first days of the expansion of the British colonies from the coast of North America into the heartland of the continent, a recurring problem was that of transportation between the coastal ports and the interior. This was not unique to the Americas, and the problem still exists in those parts of the world where muscle power provides a primary means of transportation within a region. An equally ancient solution was implemented in many cultures — floating vessels move more easily than land vehicles since friction becomes significantly less. Close to the seacoast, rivers often provided adequate waterways, but the Appalachian Mountains, 400 miles (640 km) inland, running over 1,500 miles (2,400 km) long as a barrier range with just five places where mule trains or wagon roads could be routed, presented a great challenge. Passengers and freight had to travel overland, a journey made more difficult by the rough condition of the roads. In 1800, it typically took 2-1/2 weeks to travel overland from New York to Cleveland, Ohio (460 miles (740 km)); 4 weeks to Detroit (612 miles (985 km)). The principal exportable product of the Ohio Valley was grain, which was a high-volume, low-priced commodity, bolstered by supplies from the coast. Frequently it was not worth the cost of transporting it to far-away population centers. This was a factor leading to farmers in the west turning their grains into whiskey for easier transport and higher sales, and later the Whiskey Rebellion. In the 18th and early 19th centuries, it became clear to coastal residents that the city or state that succeeded in developing a cheap, reliable route to the West would enjoy economic success, and the port at the seaward end of such a route would see business increase greatly. In time, projects were devised in Virginia, Maryland, Pennsylvania, and relatively deep into the coastal states. The successes of the Canal du Midi in France (1681), Bridgewater Canal in Britain (1769), and Eider Canal in Denmark (1784) spurred on what was called in Britain "canal mania". The idea of a canal to tie the East Coast to the new western settlements was discussed as early as 1724: New York provincial official Cadwallader Colden made a passing reference (in a report on fur trading) to improving the natural waterways of western New York. Gouverneur Morris and Elkanah Watson were early proponents of a canal along the Mohawk River. 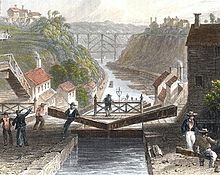 Their efforts led to the creation of the "Western and Northern Inland Lock Navigation Companies" in 1792, which took the first steps to improve navigation on the Mohawk and construct a canal between the Mohawk and Lake Ontario, but it was soon discovered that private financing was insufficient. Christopher Colles (who was familiar with the Bridgewater Canal) surveyed the Mohawk Valley, and made a presentation to the New York state legislature in 1784, proposing a shorter canal from Lake Ontario. The proposal drew attention and some action but was never implemented. Jesse Hawley had envisioned encouraging the growing of large quantities of grain on the western New York plains (then largely unsettled) for sale on the Eastern seaboard. However, he went bankrupt trying to ship grain to the coast. While in Canandaigua debtors' prison, Hawley began pressing for the construction of a canal along the 90-mile (140 km)-long Mohawk River valley with support from Joseph Ellicott (agent for the Holland Land Company in Batavia). Ellicott realized that a canal would add value to the land he was selling in the western part of the state. He later became the first canal commissioner. 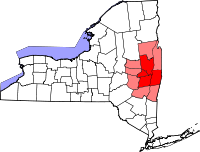 The Mohawk River (a tributary of the Hudson) rises near Lake Ontario and runs in a glacial meltwater channel just north of the Catskill range of the Appalachian Mountains, separating them from the geologically distinct Adirondacks to the north. The Mohawk and Hudson valleys form the only cut across the Appalachians north of Alabama, allowing an almost complete water route from New York City in the south to Lake Ontario and Lake Erie in the west. Along its course and from these lakes, other Great Lakes, and to a lesser degree, related rivers, a large part of the continent's interior (and many settlements) would be made well connected to the Eastern seaboard. 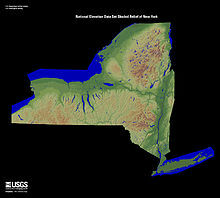 The problem was that the land rises about 600 feet (180 m) from the Hudson to Lake Erie. Locks at the time could handle up to 12 feet (3.7 m) of lift, so even with the heftiest cuttings and viaducts, fifty locks would be required along the 360-mile (580 km) canal. Such a canal would be expensive to build even with modern technology; in 1800, the expense was barely imaginable. President Thomas Jefferson called it "a little short of madness" and rejected it; however, Hawley interested New York Governor DeWitt Clinton in the project. There was much opposition, and the project was ridiculed as "Clinton's folly" and "Clinton's ditch." In 1817, though, Clinton received approval from the legislature for $7 million for construction. The original canal was 363 miles (584 km) long, from Albany on the Hudson to Buffalo on Lake Erie. The channel was cut 40 feet (12 m) wide and 4 feet (1.2 m) deep, with removed soil piled on the downhill side to form a walkway known as a towpath. Its construction, through limestone and mountains, proved a daunting task. In 1823 construction reached the Niagara Escarpment, necessitating the building of five locks along a 3-mile (4.8 km) corridor to carry the canal over the escarpment. To move earth, animals pulled a "slip scraper" (similar to a bulldozer). The sides of the canal were lined with stone set in clay, and the bottom was also lined with clay. The stonework required hundreds of German masons, who later built many of New York's buildings. All labor on the canal depended upon human (and animal) power or the force of water. Engineering techniques developed during its construction included the building of aqueducts to redirect water; one aqueduct was 950 feet (290 m) long to span 800 feet (240 m) of river. As the canal progressed, the crews and engineers working on the project developed expertise and became a skilled labor force. Canal boats up to 3.5 feet (1.1 m) in draft were pulled by horses and mules walking on the towpath. The canal had one towpath, generally on the north side. When canal boats met, the boat with the right of way remained on the towpath side of the canal. The other boat steered toward the berm (or heelpath) side of the canal. The driver (or "hoggee", pronounced HO-gee) of the privileged boat kept his towpath team by the canalside edge of the towpath, while the hoggee of the other boat moved to the outside of the towpath and stopped his team. His towline would be unhitched from the horses, go slack, fall into the water and sink to the bottom, while his boat coasted with its remaining momentum. The privileged boat's team would step over the other boat's towline, with its horses pulling the boat over the sunken towline without stopping. Once clear, the other boat's team would continue on its way. Pulled by teams of horses, canal boats moved slowly, but methodically, shrinking time and distance. Efficiently, the smooth, nonstop method of transportation cut the travel time between Albany and Buffalo nearly in half, moving by day and by night. Migrants took passage on freight boats, camping on deck or on top of crates. Men and women boarded barges to venture west, to visit relatives, or just for a relaxing excursion. Construction began July 4, 1817, at Rome, New York. 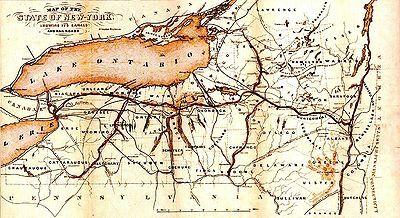 The first 15 miles (24 km), from Rome to Utica, opened in 1819. At that rate, the canal would not be finished for 30 years. The main delays were caused by felling trees to clear a path through virgin forest and moving excavated soil, which took longer than expected, but the builders devised ways to solve these problems. To fell a tree, they threw rope over the top branches and winched it down. They pulled out the stumps with an innovative stump puller. Two huge wheels were mounted loose on the ends of an axle. A third wheel, slightly smaller than the others, was fixed to the center of the axle. A chain was wrapped around the axle and hooked to the stump. A rope was wrapped around the center wheel and hooked to a team of oxen. The mechanical advantage (torque) obtained ripped the stumps out of the soil. Soil to be moved was shoveled into large wheelbarrows that were dumped into mule-pulled carts. Using a scraper and a plow, a three-man team with oxen, horses and mules could build a mile in a year. Construction continued at an increased rate as new workers arrived. When the canal reached Montezuma Marsh (at the outlet of Cayuga Lake west of Syracuse), it was rumored that over 1,000 workers died of "swamp fever" (malaria), and construction was temporarily stopped. However, recent research has revealed that the death toll was likely much lower, as no contemporary reports mention significant worker mortality, and mass graves from the period have never been found in the area. Work continued on the downhill side towards the Hudson, and the crews worked on the section across the swampland when it froze in winter. The middle section from Utica to Salina (Syracuse) was completed in 1820, and traffic on that section started up immediately. Expansion to the east and west proceeded simultaneously, and the whole eastern section, 250 miles (400 km) from Brockport to Albany, opened on September 10, 1823, to great fanfare. The Champlain Canal, a separate but connected 64-mile (103 km) north-south route from Watervliet on the Hudson to Lake Champlain, opened on the same date. In 1824, before the canal was completed, a detailed Pocket Guide for the Tourist and Traveler, Along the Line of the Canals, and the Interior Commerce of the State of New York, was published for the benefit of travelers and land speculators. After Montezuma Marsh, the next difficulties were crossing Irondequoit Creek and the Genesee River near Rochester. The former ultimately required building the 1,320-foot (400 m) long "Great Embankment," to carry the canal at a height of 76 feet (23 m) above the level of the creek, which ran through a 245-foot (75 m) culvert underneath. The canal crossed the river on a stone aqueduct, 802 feet (244 m) long and 17 feet (5.2 m) wide, supported by 11 arches. After the Genesee, the next obstacle was crossing the Niagara Escarpment, an 80-foot (24 m)-high wall of hard dolomitic limestone, to reach the level of Lake Erie. The route followed the channel of a creek that had cut a ravine steeply down the escarpment. The construction and operation of two sets of five locks there soon gave rise to the community of Lockport. The 12-foot (3.7 m) lift-locks had a total lift of 60 feet (18 m), exiting into a deeply cut channel. The final leg had to be cut 30 feet (9.1 m) deep through another limestone mass, the Onondaga ridge. Much of that section was blasted with black powder, and the inexperience of the crews often led to accidents, and sometimes to rocks falling on nearby homes. Two villages competed to be the terminus: Black Rock, on the Niagara River, and Buffalo, at the eastern tip of Lake Erie. Buffalo expended great energy to widen and deepen Buffalo Creek to make it navigable and to create a harbor at its mouth. Buffalo won over Black Rock, and grew into a large city, eventually encompassing its former rival. The entire canal was officially completed on October 26, 1825. The event was marked by a statewide "Grand Celebration," culminating in a series of cannon shots along the length of the canal and the Hudson, a 90-minute cannonade from Buffalo to New York City. A flotilla of boats, led by Governor Dewitt Clinton aboard Seneca Chief, sailed from Buffalo to New York City over ten days. Clinton then ceremonially poured Lake Erie water into New York Harbor to mark the "Wedding of the Waters." On its return trip, Seneca Chief brought back a keg of Atlantic Ocean water, which was poured into Lake Erie by Buffalo's Judge Samuel Wilkeson, who would later become mayor. The Erie Canal was thus completed in eight years at a cost of $7,143,000 (equivalent to $112,000,000 in 2018). It was acclaimed as an engineering marvel that united the country and helped New York City become a financial capital. 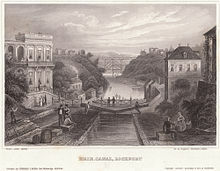 Lithograph of the Erie Canal at Lockport, New York c.1855. Published for Herrman J. Meyer, 164 William Street, New York City. The canal began on the west side of the Hudson River at Albany, and ran north to Watervliet, where the Champlain Canal branched off. At Cohoes, it climbed the escarpment on the west side of the Hudson River and then turned west along the south shore of the Mohawk River, crossing to the north side at Crescent and again to the south at Rexford. The canal continued west near the south shore of the Mohawk River all the way to Rome, where the Mohawk turns north. At Rome, the canal continued west parallel to Wood Creek, which flows westward into Oneida Lake, and turned southwest and west cross-country to avoid the lake. From Canastota west, it ran roughly along the north (lower) edge of the Onondaga Escarpment, passing through Syracuse, Onondaga Lake, and Rochester. Before reaching Rochester, the canal uses a series of natural ridges to cross the deep valley of Irondequoit Creek. At Lockport the canal turned southwest to rise to the top of the Niagara Escarpment, using the ravine of Eighteen Mile Creek. The canal continued south-southwest to Pendleton, where it turned west and southwest, mainly using the channel of Tonawanda Creek. From the Tonawanda south toward Buffalo, it ran just east of the Niagara River, where it reached its "Western Terminus" at Little Buffalo Creek (later it became the Commercial Slip), which discharged into the Buffalo River just above its confluence with Lake Erie. With Buffalo's re-excavation of the Commercial Slip, completed in 2008, the Canal's original terminus is now re-watered and again accessible by boats. With several miles of the Canal inland of this location still lying under 20th-century fill and urban construction, the effective western navigable terminus of the Erie Canal is found at Tonawanda. The Erie made use of the favorable conditions of New York's unique topography, which provided that area with the only break in the Appalachians south of the Saint Lawrence River. The Hudson is tidal to Troy, and Albany is west of the Appalachians. It allowed for east–west navigation from the coast to the Great Lakes within US territory. The canal system thus gave New York a competitive advantage, helped New York City develop as an international trade center, and allowed Buffalo to grow from just 200 settlers in 1820 to more than 18,000 people by 1840. The port of New York became essentially the Atlantic home port for all of the Midwest—because of this vital connection and others to follow, such as the railroads, New York would become known as the "Empire State" or "the great Empire State". Derelict aqueduct over Nine Mile Creek north of Camillus, New York built in 1841 and abandoned c. 1918; one of 32 navigable aqueducts on the Erie Canal, it has since been restored. Problems developed but were quickly solved. Leaks developed along the entire length of the canal, but these were sealed using cement that hardened underwater (hydraulic cement). Erosion on the clay bottom proved to be a problem and the speed was limited to 4 mph (6.4 km/h). The original design planned for an annual tonnage of 1.5 million tons (1.36 million metric tons), but this was exceeded immediately. An ambitious program to improve the canal began in 1834. During this massive series of construction projects, known as the First Enlargement, the canal was widened from 40 to 70 feet (12 to 21 m) and deepened from 4 to 7 feet (1.2 to 2.1 m). Locks were widened and/or rebuilt in new locations, and many new navigable aqueducts were constructed. The canal was straightened and slightly re-routed in some stretches, resulting in the abandonment of short segments of the original 1825 canal. The First Enlargement was completed in 1862, with further minor enlargements in later decades. Today, the reconfiguration of the canal created during the First Enlargement is commonly referred to as the "Improved Erie Canal" or the "Old Erie Canal", to distinguish it from the canal's modern-day course. Existing remains of the 1825 canal abandoned during the Enlargement are officially referred to today as "Clinton's Ditch" (which was also the popular nickname for the entire Erie Canal project during its original 1817–1825 construction). Upstream view of the downstream lock at Lock 32, Pittsford, New York. Additional feeder canals soon extended the Erie Canal into a system. These included the Cayuga-Seneca Canal south to the Finger Lakes, the Oswego Canal from Three Rivers north to Lake Ontario at Oswego, and the Champlain Canal from Troy north to Lake Champlain. From 1833 to 1877, the short Crooked Lake Canal connected Keuka Lake and Seneca Lake. The Chemung Canal connected the south end of Seneca Lake to Elmira in 1833, and was an important route for Pennsylvania coal and timber into the canal system. The Chenango Canal in 1836 connected the Erie Canal at Utica to Binghamton and caused a business boom in the Chenango River valley. The Chenango and Chemung canals linked the Erie with the Susquehanna River system. The Black River Canal connected the Black River to the Erie Canal at Rome and remained in operation until the 1920s. The Genesee Valley Canal was run along the Genesee River to connect with the Allegheny River at Olean, but the Allegheny section, which would have connected to the Ohio and Mississippi rivers, was never built. The Genesee Valley Canal was later abandoned and became the route of the Genesee Valley Canal Railroad. In 1903 the New York State legislature authorized construction of the New York State Barge Canal as the "Improvement of the Erie, the Oswego, the Champlain, and the Cayuga and Seneca Canals". :14 In 1905, construction of the Barge Canal began, which was completed in 1918, at a cost of $96.7 million. :557 Freight traffic reached a total of 5.2 million short tons (4.7 million metric tons) by 1951, before declining in the face of combined rail and truck competition. Map of the "Water Level Routes" of the New York Central Railroad (purple), West Shore Railroad (red) and Erie Canal (blue). As the canal brought travelers to New York City, it took business away from other ports such as Philadelphia and Baltimore. Those cities and their states started projects to compete with the Erie Canal. In Pennsylvania, the Main Line of Public Works was a combined canal and railroad running west from Philadelphia to Pittsburgh on the Ohio River, opened in 1834. In Maryland, the Baltimore and Ohio Railroad ran west to Wheeling, West Virginia, also on the Ohio River, and was completed in 1853. Other competition was more direct. The Mohawk and Hudson Railroad opened in 1837, providing a bypass to the slowest part of the canal between Albany and Schenectady. 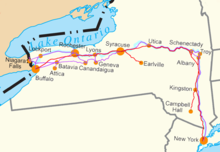 Other railroads were soon chartered and built to continue the line west to Buffalo, and in 1842 a continuous line (which later became the New York Central Railroad and its Auburn Road in 1853) was open the whole way to Buffalo. As the railroad served the same general route as the canal, but provided for faster travel, passengers soon switched to it. However, as late as 1852, the canal carried thirteen times more freight tonnage than all the railroads in New York State combined; it continued to compete well with the railroads through 1902, when tolls were abolished. During Rockefeller's consolidations of the late 1860s and early 1870s, he used the canal as a cheaper form of transportation – in the summer months when it was not frozen – to get his refined oil from Cleveland to New York City. In the winter months his only options were the three trunk lines: the Erie Railroad, the New York Central Railroad, or the Pennsylvania Railroad. The New York, West Shore and Buffalo Railway was completed in 1884, as a route running closely parallel to both the canal and the New York Central Railroad. However, it went bankrupt and was acquired the next year by the New York Central. The Erie Canal greatly lowered the cost of shipping between the Midwest and the Northeast, bringing much lower food costs to Eastern cities and allowing the East to economically ship machinery and manufactured goods to the Midwest. The canal also made an immense contribution to the wealth and importance of New York City, Buffalo and New York State. Its impact went much further, increasing trade throughout the nation by opening eastern and overseas markets to Midwestern farm products and by enabling migration to the West. The Erie Canal was an immediate success. Tolls collected on freight had already exceeded the state's construction debt in its first year of official operation. :52 By 1828, import duties collected at the New York Customs House supported federal government operations and provided funds for all the expenses in Washington except the interest on the national debt. Additionally, New York State's initial loan for the original canal had been paid by 1837.:52 Although it had been envisioned as primarily a commercial channel for freight boats, passengers also traveled on the canal's packet boats. In 1825 more than 40,000 passengers took advantage of the convenience and beauty of canal travel. :52 The canal's steady flow of tourists, businessmen and settlers lent it to uses never imagined by its initial sponsors. Evangelical preachers made their circuits of the upstate region, and the canal served as the last leg of the Underground Railroad ferrying runaway slaves to Buffalo near the Canada–US border. :53 Aspiring merchants found that tourists were reliable customers. Vendors moved from boat to boat peddling items such as books, watches and fruit, while less scrupulous "confidence men" sold remedies for foot corns or passed off counterfeit bills. :53 Tourists were carried along the "northern tour," which ultimately led to the popular honeymoon destination Niagara Falls, just north of Buffalo. Consisting of a massive stone aqueduct which carried boats over incredible cascades, Little Falls was one of the most popular stops for American and foreign tourists. This is shown in Scene 4 of William Dunlap's play A Trip to Niagara, where he depicts the general preference of tourists to travel by canal so that they could experience a combination of artificial and natural sights. :55 Canal travel was, for many, an opportunity to take in the sublime and commune with nature. The play also reflects the less enthusiastic view of some who saw movement on the canal as tedious. New ethnic Irish communities formed in some towns along its route after completion, as Irish immigrants were a large portion of the construction labor force. Earth extracted from the canal was transported to the New York City area and used as landfill in New York and New Jersey. A plaque honoring the canal's construction is located in Battery Park in southern Manhattan. Because so many immigrants traveled on the canal, many genealogists have sought copies of canal passenger lists. Apart from the years 1827–1829, canal boat operators were not required to record passenger names or report them to the government, which, in this case, was the state of New York. Some passenger lists survive today in the New York State Archives, and other sources of traveler information are sometimes available. The Canal also helped bind the still-new nation closer to Britain and Europe. Repeal of Britain's Corn Law resulted in a huge increase in exports of Midwestern wheat to Britain. Trade between the United States and Canada also increased as a result of the repeal and a reciprocity (free-trade) agreement signed in 1854. Much of this trade flowed along the Erie. Its success also prompted imitation: a rash of canal-building followed. Also, the many technical hurdles that had to be overcome made heroes of those whose innovations made the canal possible. This led to an increased public esteem for practical education. Chicago, among other Great Lakes cities, recognized the importance of the canal to its economy, and two West Loop streets are named "Canal" and "Clinton" (for canal proponent DeWitt Clinton). Concern that erosion caused by logging in the Adirondacks could silt up the canal contributed to the creation in 1885 of another New York National Historic Landmark, the Adirondack Park. Two "low" lift bridges in Lockport, New York July 2010. Many notable authors wrote about the canal, including Herman Melville, Frances Trollope, Nathaniel Hawthorne, Harriet Beecher Stowe, Mark Twain, Samuel Hopkins Adams and the Marquis de Lafayette, and many tales and songs were written about life on the canal. The popular song "Low Bridge" by Thomas S. Allen was written in 1905 to memorialize the canal's early heyday, when barges were pulled by mules rather than engines. 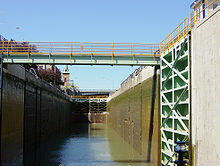 The modern Erie Canal has 34 locks, which are painted with the blue and gold colors of the New York State Canal System. In 1918, the Canal was replaced by the larger New York State Barge Canal. This new canal replaced much of the original route, leaving many abandoned sections (most notably between Syracuse and Rome). New digging and flood control technologies allowed engineers to canalize rivers that the original canal had sought to avoid, such as the Mohawk, Seneca, and Clyde rivers, and Oneida Lake. In sections that did not consist of canalized rivers (particularly between Rochester and Buffalo), the original Erie Canal channel was enlarged to 120 feet (37 m) wide and 12 feet (3.7 m) deep. The expansion allowed barges up to 2,000 short tons (1,800 t) to use the Canal. This expensive project was politically unpopular in parts of the state not served by the canal, and failed to save it from becoming obsolete for commercial shipping. 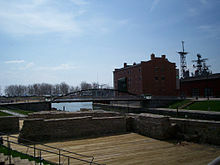 This photo shows the Gateway Harbor in North Tonawanda, NY about 1000 feet from the present day western terminus of the Erie Canal where it connects to the Niagara River. While the old Canal ran next to the Mohawk all the way to Rome, the new canal ran through the river, which was straightened or widened where necessary. :13 At Ilion, the new canal left the river for good, but continued to run on a new alignment parallel to both the river and the old canal to Rome. From Rome, the new route continued almost due west, merging with Fish Creek just east of its entry into Oneida Lake. From Oneida Lake, the new canal ran west along the Oneida River, with cutoffs to shorten the route. At Three Rivers the Oneida River turns northwest, and was deepened for the Oswego Canal to Lake Ontario. The new Erie Canal turned south there along the Seneca River, which turns west near Syracuse and continues west to a point in the Montezuma Marsh (43°00′11″N 76°43′52″W﻿ / ﻿43.00296°N 76.73115°W﻿ / 43.00296; -76.73115). There the Cayuga and Seneca Canal continued south with the Seneca River, and the new Erie Canal again ran parallel to the old canal along the bottom of the Niagara Escarpment, in some places running along the Clyde River, and in some places replacing the old canal. At Pittsford, southeast of Rochester, the canal turned west to run around the south side of Rochester, rather than through downtown. The canal crosses the Genesee River at the Genesee Valley Park (43°07′17″N 77°38′33″W﻿ / ﻿43.1215°N 77.6425°W﻿ / 43.1215; -77.6425), then rejoins the old path near North Gates. From there it was again roughly an upgrade to the original canal, running west to Lockport. This reach of 64.2 miles from Henrietta to Lockport is called "the 60‑mile level" since there are no locks and the water level rises only two feet over the entire segment. Diversions from and to adjacent natural streams along the way are used to maintain the canal's level. It runs southwest to Tonawanda, where the new alignment discharges into the Niagara River, which is navigable upstream to the New York Barge Canal's Black Rock Lock and thence to the Canal's original "Western Terminus" at Buffalo's Inner Harbor. The growth of railroads and highways across the state, and the opening of the Saint Lawrence Seaway, caused commercial traffic on the canal to decline dramatically during the second half of the 20th century. In 1992, the New York State Barge Canal was renamed the New York State Canal System (including the Erie, Cayuga-Seneca, Oswego, and Champlain canals) and placed under the newly created New York State Canal Corporation, a subsidiary of the New York State Thruway Authority. While part of the Thruway, the canal system was operated using money generated by Thruway tolls. Since the 1990s, the canal system has been used primarily by recreational traffic, although a small but growing amount of cargo traffic still uses it. Today, the Erie Canalway National Heritage Corridor covers 524 miles (843 km) of navigable water from Lake Champlain to the Capital Region and west to Buffalo. The area has a population of 2.7 million: about 75% of Central and Western New York's population lives within 25 miles (40 km) of the Erie Canal. The Erie Canal is open to small craft and some larger vessels from May through November each year. During winter, water is drained from parts of the canal for maintenance. The Champlain Canal, Lake Champlain, and the Chambly Canal, and Richelieu River in Canada form the Lakes to Locks Passage, making a tourist attraction of the former waterway linking eastern Canada to the Erie Canal. In 2006 recreational boating fees were eliminated to attract more visitors. Travel on the canal's middle section (particularly in the Mohawk Valley) was severely hampered by flooding in late June and early July 2006. Flood damage to the canal and its facilities was estimated as at least $15 million. There were some 42 commercial shipments on the canal in 2008, compared to 15 such shipments in 2007 and more than 33,000 shipments in 1855, the canal's peak year. The new growth in commercial traffic is due to the rising cost of diesel fuel. Canal barges can carry a short ton of cargo 514 miles (827 km) on one gallon of diesel fuel, while a gallon allows a train to haul the same amount of cargo 202 miles (325 km) and a truck 59 miles (95 km). Canal barges can carry loads up to 3,000 short tons (2,700 long tons), and are used to transport objects that would be too large for road or rail shipment. Today, the system is served by several commercial towing companies. In 2012, the New York State Canal System (which consists of the Erie Canal and a few smaller canals) was used to ship 42,000 tons of cargo. Erie Canal Aqueduct crossing the Genesee River in Rochester, New York. Broad Street now runs atop it. A proposed rewatering project of the Erie Canal Aqueduct to connect to a round lock on the Genesee River is under review. This revitalization project will also facilitate boating. A commercial tour boat locks through Baldwinsville's Lock 24. Aside from transportation, numerous businesses, farms, factories and communities alongside its banks still utilize the canal's waters for other purposes such as irrigation for farmland, hydroelectricity, research, industry, and even drinking. Use of the canal system has an estimated total economic impact of $6.2 billion annually. In 2017, the New York State Canal Corporation was transferred from the New York State Thruway to the New York Power Authority. Sections of the old Erie Canal not used after 1918 are owned by New York State, or have been ceded to or purchased by counties or municipalities. Many stretches of the old canal have been filled in to create roads such as Erie Boulevard in Syracuse and Schenectady, and Broad Street and the Rochester Subway in Rochester. A 36‑mile (58 km) stretch of the old canal from the town of DeWitt, New York, east of Syracuse, to just outside Rome, New York, is preserved as the Old Erie Canal State Historic Park. 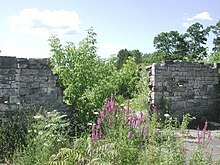 In 1960 the Schoharie Crossing State Historic Site, a section of the canal in Montgomery County, was one of the first sites recognized as a National Historic Landmark. Some municipalities have preserved sections as town or county canal parks, or have plans to do so. Camillus Erie Canal Park preserves a 7-mile (11 km) stretch and has restored Nine Mile Creek Aqueduct, built in 1841 as part of the First Enlargement of the canal. In some communities, the old canal has refilled with overgrowth and debris. Proposals have been made to rehydrate the old canal through downtown Rochester or Syracuse as a tourist attraction. In Syracuse, the location of the old canal is represented by a reflecting pool in downtown's Clinton Square and the downtown hosts a canal barge and weigh lock structure, now dry. Buffalo's Commercial Slip is the restored and re-watered segment of the canal which formed its "Western Terminus". The Erie Canal is a destination for tourists from all over the world, and has inspired guidebooks dedicated to exploration of the waterway. An Erie Canal Cruise company, based in Herkimer, operates from mid-May until mid-October with daily cruises. The cruise goes through the history of the canal and also takes passengers through Lock 18. In 2004, the administration of New York Governor George Pataki was criticized when officials of New York State Canal Corporation attempted to sell private development rights to large stretches of the Old Erie Canal to a single developer for $30,000, far less than the land was worth on the open market. After an investigation by the Syracuse Post-Standard newspaper, the Pataki administration nullified the deal. Buffalo's Erie Canal Commercial Slip in Spring 2008. Records of the planning, design, construction, and administration of the Erie Canal are vast and can be found in the New York State Archives. Except for two years (1827–1829), the State of New York did not require canal boat operators to maintain or submit passenger lists. Canalside Buffalo at the Canal's "Western Terminus"
The following list of locks is provided for the current canal, from east to west. 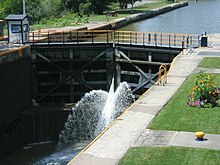 There are a total of 36 (35 numbered) locks on the Erie Canal. 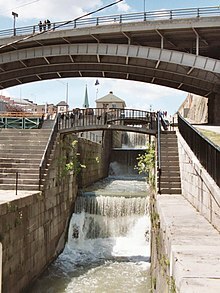 All locks on the New York State Canal System are single-chamber; the dimensions are 328 feet (100 m) long and 45 feet (14 m) wide with a minimum 12-foot (3.7 m) depth of water over the miter sills at the upstream gates upon lift. They can accommodate a vessel up to 300 feet (91 m) long and 43.5 feet (13.3 m) wide. Overall sidewall height will vary by lock, ranging between 28 and 61 feet (8.5 and 18.6 m) depending on the lift and navigable stages. Lock E17 at Little Falls has the tallest sidewall height at 80 feet (24 m). Distance is based on position markers from an interactive canal map provided online by the New York State Canal Corporation and may not exactly match specifications on signs posted along the canal. Mean surface elevations are comprised from a combination of older canal profiles and history books as well as specifications on signs posted along the canal. The margin of error should normally be within 6 inches (15 cm). All surface elevations are approximate. E34 Lockport 539.5 ft (164.4 m) 514.9 ft (156.9 m) 24.6 ft (7.5 m) E35, adjacent to Lock E34. * Denotes Federal managed locks. There is roughly a 2-foot (0.61 m) natural rise between locks E33 and E34 as well as a 1.5-foot (0.46 m) natural rise between Lock E35 and the Niagara River. There is no Lock E1 or Lock E31 on the Erie Canal. The place of "Lock E1" on the passage from the lower Hudson River to Lake Erie is taken by the Troy Federal Lock, located just north of Troy, New York, and is not part of the Erie Canal System proper. It is operated by the United States Army Corps of Engineers. The Erie Canal officially begins at the confluence of the Hudson and Mohawk rivers at Waterford, New York. Although the original alignment of the Erie Canal through Buffalo has been filled in, travel by water is still possible from Buffalo via the Black Rock Lock in the Niagara River to the canal's modern western terminus in Tonawanda, and eastward to Albany. The Black Rock Lock is operated by the United States Army Corps of Engineers. Oneida Lake lies between locks E22 and E23, and has a mean surface elevation of 370 feet (110 m). Lake Erie has a mean surface elevation of 571 feet (174 m). "Low Bridge", a song written by Thomas S. Allen, also known as "The Erie Canal Song"
^ a b "Locks on the Erie Canal". The Erie Canal. Retrieved March 9, 2017. ^ a b Roberts, Sam (June 26, 2017). "200 Years Ago, Erie Canal Got Its Start as Just a 'Ditch'". The New York Times. Retrieved July 25, 2017. ^ a b c d e f g h i j k Finch, Roy G. (1925). "The Story of the New York State Canals" (PDF). New York State Engineer and Surveyor (republished by New York State Canal Corporation). Retrieved September 25, 2012.
quotation page 87: "There was little experience moving bulk loads by carts, while a packhorse would [i.e., 'could only'] carry only an eighth of a ton [(1,250 long tons (1,270 t)]. On a soft road, a horse might be able to draw 5/8ths of a ton [(0.6250 long tons (0.6350 t)) or 5×]. But if the load were carried by a barge on a waterway, then up to 30 tons [(30 long tons (30 t) or 60,000 pounds (27,000 kg)) or 240×] could be drawn by the same horse." ^ The New York State Canal System, The Erie Canal Association. ^ Frank E. Sadowski Jr., "Clinton's Big Ditch", The Erie Canal Association. ^ Using Clark's Works of Man figures, a mule can draw 60,000 lbs but carry only 250 lbs, which need men to load and unload daily, have a need to carry grain as well (parasitic weight), and for same tonnages, required far more men as a labor force, drastically increasing running costs. A 95% reduction is probably conservative, 250 lb/30 t is 0.4% the expenses, so reduction to 5% costs still indicates someone is taking a lot of profits. ^ a b "Erie Canalway National Heritage Corridor". Retrieved September 25, 2012. ^ a b Christopher Maag (November 2, 2008). "Hints of Comeback for Nation's First Superhighway". The New York Times. • and lastly, the Mohawk River water gap and valley tributary of the Hudson River, creating what later advertising would call the level water route westwards. ^ "Railroad Travel Rates, 1800–1930". ^ Joel Achenbach, "America's River; From Washington and Jefferson to the Army Corps of Engineers, everyone had grandiose plans to tame the Potomac. Fortunately for us, they all failed". The Washington Post, May 5, 2002; p. W.12. ^ Calhoun, Daniel Hovey. The American civil engineer: Origins and conflict. Technology Press, Massachusetts Institute of Technology, 1960. ^ a b c d e f g h i j k Sheriff, Carol (1996). The Artificial River: The Erie Canal and the Paradox of Progress 1817–1862. Hill & Wang. ISBN 978-0-8090-2753-8. ^ Hunter, Louis C.; Bryant, Lynwood (1991). A History of Industrial Power in the United States, 1730–1930, Vol. 3: The Transmission of Power. Cambridge, Massachusetts, London: MIT Press. ISBN 978-0-262-08198-6. ^ Gerard Koeppel (2009). Bond of Union: Building the Erie Canal and the American Empire. Da Capo Press. pp. 212–13. ISBN 9780786745449. ^ Andrew Kitzmann (2009). Postcard History Series:Erie Canal. Arcadia Publishing. p. 71. ^ Farley, Doug (September 18, 2007). "ERIE CANAL DISCOVERY: The great embankment". Lockport Union-Sun & Journal. Retrieved May 12, 2015. ^ "The Genesee River Aqueduct". The Erie Canal. Monroe County Library System. Retrieved May 12, 2015. ^ Ransom, Roger (May 1964). "Canals and Development: A Discussion of the Issues". American Economic Review. 54 (3): 375. ^ Federal Reserve Bank of Minneapolis Community Development Project. "Consumer Price Index (estimate) 1800–". Federal Reserve Bank of Minneapolis. Retrieved January 2, 2019. ^ a b Whiteford, Noble E. (1922). History of the Barge Canal of New York State. J. B. Lyon Company. Retrieved February 7, 2008. ^ Hawke, David Freeman (1980). John D. The Founding Father of the Rockefellers. Harper & Row. ISBN 978-0060118136. ^ Taylor, George Rogers (1951). The Transportation Revolution, 1815–1860. ISBN 978-0-87332-101-3. ^ North, Douglas C. (1966). The Economic Growth of the United States 1790–1860. New York, London: W. W. Norton & Company. ISBN 978-0-393-00346-8. ^ Shelley, Thomas (2016). Fordham: A history of the Jesuit university of New York: 841–2003. New York: Fordham University Press. p. 51. ISBN 9780823271511. ^ a b "Dedication of the Flight of Five Locks as a Civil Engineering Landmark (9/9/2012)". ASCE Rennselaer. American Society of Civil Engineers (ASCE), RPI Chapter. Archived from the original on December 16, 2013. Retrieved March 2, 2013. ^ a b c Williams, Deborah (2009). Erie Canal : exploring New York's great canals : a complete guide (1st ed.). Woodstock, Vt.: Countryman Press. ISBN 978-1-58157-080-9. ^ "Commercial Shipping and Towing - New York State Canals". www.canals.ny.gov. Retrieved 2019-01-24. ^ "N.Y. Power Authority to Assume Ownwership of Canal Corporation on New Year's Day". www.nypa.gov. Retrieved 26 May 2018. ^ National Park Service, National Historic Landmarks Survey, New York Archived September 22, 2013, at the Wayback Machine, retrieved May 30, 2007. ^ Camillus Erie Canal Park, Nine Mile Creek Aqueduct, retrieved January 4, 2012. ^ Cycling the Erie Canal: A Guide to 400 Miles of Adventure and History Along the Erie Canalway Trail (Revised ed.). Parks & Trails New York. 2015. ISBN 9780974827735. ^ "A Joint Investigation into the Contract Between the New York State Canal Corporation and Richard A. Hutchens CC, LLC" (PDF). New York State Inspector General. November 2004. ^ "Guide to Canal Records". New York State Archives. Archived from the original on December 7, 2008. Retrieved January 30, 2017. ^ a b c d e National Park Service (March 13, 2009). "National Register Information System". National Register of Historic Places. National Park Service. ^ a b c New York State Canal Corporation – Canal Map, New York State Canals, Retrieved January 26, 2015. ^ New York State Canal Corporation – Frequently Asked Questions, Retrieved January 26, 2015. ^ a b The Erie Canal – Locks, Retrieved January 26, 2015. ^ The Erie Canal, History of the Barge Canal of New York State by Noble E. Whitford, 1921, Chapter 23, Retrieved January 28, 2015. ^ Wilfred H. Schoff, The New York State Barge Canal, 1915, American Geographical Society, Vol. 47, No. 7, p. 498, Retrieved January 26, 2015. ^ The Erie Canal – Canal Profiles, Retrieved January 6, 2015. Bangs, Jeremy D. (2015). The Travels of Elkanah Watson. Jefferson, N.C.: McFarland & Company. ISBN 9781476662459. OCLC 908375479. Bernstein, Peter L. (2005). Wedding of the Waters: The Erie Canal and the Making of a Great Nation (1st ed.). New York [u.a. ]: Norton. ISBN 978-0-393-05233-6. Erie Canal Museum; Morganstein, Martin; Cregg, Joan H. (2001). Erie Canal. Charleston, S.C.: Arcadia Pub. Co. ISBN 978-0738508696. Finch, Roy G. (1925). The Story of the New York State Canals: Historical and Commercial Information (PDF). New York State Canal Corporation. OCLC 1038442328. Retrieved March 9, 2013. Hecht, Roger W., ed. (2003). The Erie Canal Ceader, 1790–1950 (1st ed.). Syracuse, N.Y.: Syracuse University Press. ISBN 9780815607595. Keene, Michael (2016). The Psychic Highway: How the Erie Canal Changed America. Fredericksburg, Va.: Willow Manor Publishing. ISBN 9781939688323. Kelly, Jack (2016). Heaven's Ditch: God, Gold, and Murder on the Erie Canal. New York: St. Martin's Press. ISBN 9781137280091. Koeppel, Gerard (2009). Bond of Union: Building the Erie Canal and the American Empire. Cambridge, Mass. : Da Capo Press. ISBN 978-0-306-81827-1. McGreevy, Patrick (2009). Stairway to Empire: Lockport, the Erie Canal, and the Shaping of America. Albany, N.Y.: SUNY Press. ISBN 978-1-4384-2527-6. Online review. Panagopoulos, Janie Lynn (1995). Erie Trail West: A Dream-Quest Adventure. Spring Lake, MI: River Road Publications. ISBN 978-0-938682-35-6. Papp, John P. (1977). Erie Canal Days: A Pictorial Essay: Albany to Buffalo. Schenectady, N.Y.: John Papp Historical Publications. OCLC 3863574. Reisem, Richard O. (2000). Erie Canal Legacy: Architectural Treasures of the Empire State. Rochester, N.Y.: Landmark Society of Western New York. ISBN 978-0964170667. Shaw, Ronald E. (1990) . Erie Water West: A History of the Erie Canal, 1792–1854 (Reprint ed.). Lexington, Ky.: University Press of Kentucky. ISBN 9780813143477. OCLC 929658651. Sheriff, Carol (1996). The Artificial River: The Erie Canal and the Paradox of Progress, 1817–1862. New York: Hill and Wang. ISBN 978-0-8090-2753-8. Stack, Debbie Daino; Cuomo, Captain Ronald S. Marquisee (2001). The Erie Canal: Cruising America's Waterways. Cruising America's Waterways Series. Foreword by Andrew Cuomo. Manlius, N.Y.: Media Artists Inc. ISBN 978-0970888600. Williams, Deborah (2009). Erie Canal: Exploring New York's Great Canals: A Complete Guide (1st ed.). Woodstock, Vermont: Countryman Press. ISBN 978-1-58157-080-9. Wikimedia Commons has media related to Erie Canal. 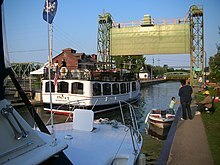 Wikivoyage has a travel guide for Erie Canal. Photographs of the Erie Canal Relating to Fort Hunter, N.Y. Ca. 1910 (finding aid) at the New York State Library, accessed May 18, 2016. Historic American Buildings Survey (HABS) No. NY-231, "Erie Canal Viaduct, Moyer Creek Crossing"
HABS No. NY-6040, "Erie Canal Locks"
Historic American Engineering Record (HAER) No. NY-6, "Erie Canal (Enlarged), Schoharie Creek Aqueduct"
HAER No. NY-11, "Erie Canal (Enlarged), Lock Number 18"
HAER No. NY-12, "Erie Canal (Enlarged), Upper Mohawk River Aqueduct"
HAER No. NY-16, "Erie Canal, Yankee Hill Lock Number 28"
HAER No. NY-17, "Erie Canal (Enlarged), Empire Lock Number 29"
HAER No. NY-152, "Erie Canal (Enlarged), Oothout Culvert & Waste Weir"
HAER No. NY-157, "Eagle's Nest Creek Culvert"
HAER No. 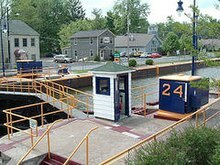 NY-337, "Erie Canal (Original), Locks 37 & 38"
HAER No. NY-545, "Erie Canal (Original), Lock Number 20"
This page was last edited on 17 April 2019, at 09:34 (UTC).